The insidious growth of India’s Maoist movement has troubled the Central Government authorities who have been unable to check it beyond sending Reserve Police Forces to deal with the issue and creating a body known as the Salwa Judum in Chattisgarh. Also referred to as Naxalites, despite being a far wider movement than the original uprising in Naxalbari that gave rise to the name, the Maoists have made their way to the international media for a blend of violence and Robin Hood tactics. Arundhati Roy, for one, is a staunch supporter. 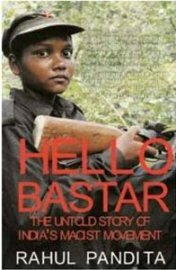 Rahul Pandita’s Hello Bastar is an in depth study of the movement, tracing its roots from Naxalbari and describing its spread and the reasons behind it. He actually spent over a decade traversing the jungles in Central India and visiting the remoter places where there is no food but red chutney on occasion. The title refers to the guerrilla base that the Maoists created in Bastar. What makes the book different is the fact that it shows the Maoist side of the movement, a side that has not really been exposed in detail. Many readers are aware that it has something to do with giving the marginalised adivasis a future but most know nothing beyond the reports of policemen killed in the papers. A great deal of research has quite obviously gone into the book – Pandita has names, numbers, the name of the first squad member who died for the cause, interviews with Maoist leaders and even photographs. He managed to put together an incredible amount of information which the Maoists have apparently shared freely with him. This could possibly be because they know that they are several steps ahead of the Government forces or because they are certain that they are in the right and will win. Certainly it is clear that the movement grew in strength because of patriarchal casteism against the Dalits, a droit de seigneur attitude towards their women and exploitation of the adivasis at a grassroots level. The Central Government ignored it because it was either uninformed or had other more important matters to pursue. The result was that a spark became a wildfire, while the socio-economic divide between the tribal dominated states and the developed regions of India, like Metropolitan Delhi, has actually widened. Now, the Maoist have plans to spread into the cities and confess that unlike the Naxalites, they have failed to appeal to college students – ex-Naxalite leader Kanu Sanyal before his 2010 suicide, declared that Maoism, unlike Naxalism was not populist and he was right where urban supporters were concerned. Pandita could be accused of a one sided approach – his book presents the Maoist story and has in fact the approval of Kobad Ghandy, the ideologue who was arrested in Delhi to much fanfare, in the form of an afterword. Ghandy writes ‘Besides general reading, this book could be useful for any future dialogue between the government and the Maoists which is an urgent necessity.’ He also calls Pandita’s work ‘refreshing’ which it certainly is because Pandita’s style is easy to read. An ordinary reader may be confused by the acronyms and the names that are scattered freely across the pages, but the book does provide a vital insight into an issue that is spiralling out of control, so perseverance is recommended. Rahul Pandita currently works with Open magazine. He specialises in chronicling conflicts and has reported extensively on Iraq, Sri Lanka, Kashmir, India’s Northeast and Naxal affected areas. However, he points out that is a fine dividing line between stupidity and courage and that a dead journalist is a bad journalist – presumably that was how he was able to extract as much information as he did. No Comments on "What Lies Beneath"